As you guys know, I’m a huge grilled cheese fan. And by grilled cheese I mean, buttered bread pan-fried until the cheese is melty and gooey and the outside of the bread is crisp and the inside of the bread is still a bit soft. Cheese toasties –cheese melted on bread in a toaster– are not grilled cheeses and never will be. They have their time and place in the world too, but grilled cheese will forever have my heart. I absolutely do not remember the first time I had a grilled cheese, but last year, when I went over to my friend’s house, I made her son his first ever grilled cheese. I had gone over to visit with her brand new baby and drop off some noodle salad. Her older son (he was about 5 at the time) wasn’t so into the noodle salad so I offered to make him a grilled cheese. I felt so good. Can you imagine tasting a grilled cheese for the first time? 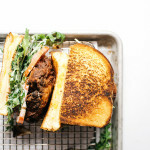 I kind of imagine that if you had a bite of this insane fried chicken grilled cheese sandwich, you’d get all the feels. 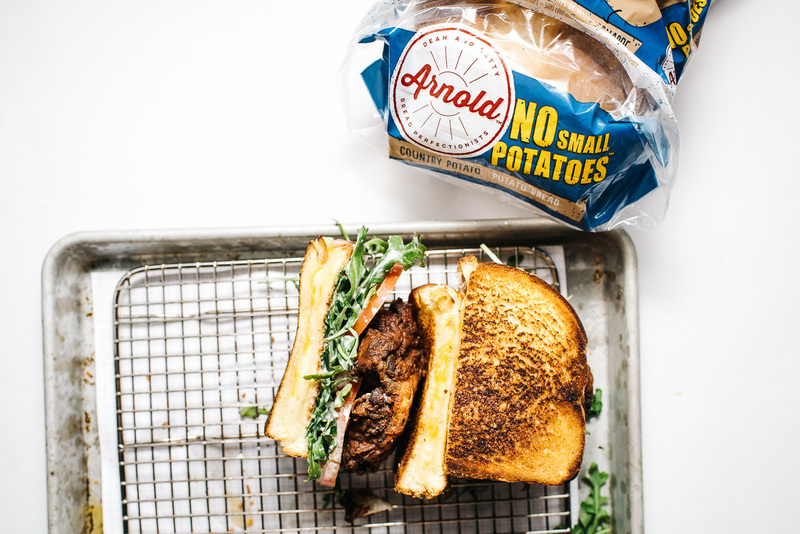 We have this yummy looking new bread here on the West Coast called Arnold and I literally squee’d when I saw the super cute name and package (No Small Potatoes!!). 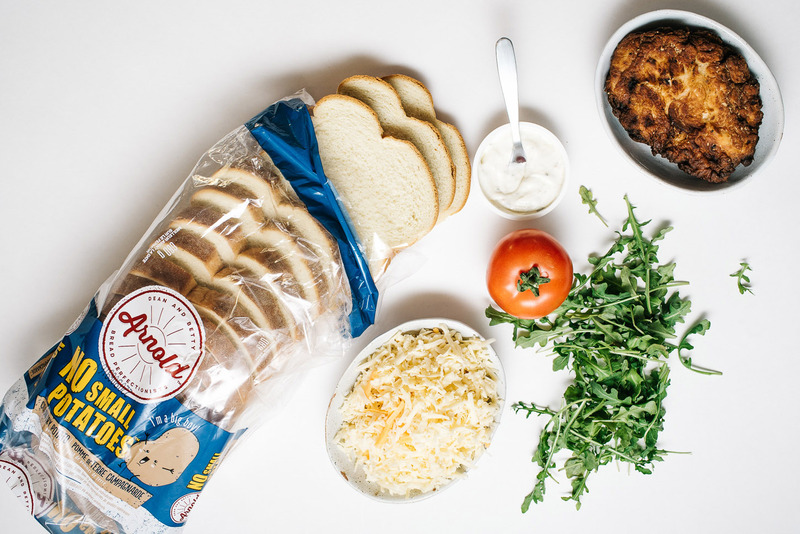 I got their pillowy homestyle-tasting “premium potato” country potato bread, made two crisp and fluffy grilled cheeses, and put a piece of fried chicken, along with some greens, tomatoes, and ranch in between them. Friends, it was a pro move – I hope you do it! Place the chicken breast in the buttermilk. Let sit, for at least 10 minutes at room temperature, or if you have the time, covered, overnight in the fridge. In a shallow container, whisk together the flour, garlic powder, salt, and pepper. Take the chicken out of the buttermilk, shake gently, then coat in flour, pressing to ensure all sides are covered. Let sit on a plate while you heat up the oil. Heat up at least 1-2 inches of oil (I prefer rice bran or grapeseed) in a deep cast iron or heavy bottomed pot over medium heat until 375°F. Carefully add the coated chicken to the hot oil and fry. Flip occasionally as needed, until crunchy, brown and cooked through, 8-10 minutes or until the internal temperature of the breast reaches 165°F. Place on a wire rack while making the grilled cheeses. Heat up two non-stick frying pans over medium-low heat. Butter two slices of bread and place one in each pan, butter-side down. Top both slices evenly with the shredded cheese. Butter the other slices of bread and place on top of the cheese, butter-sides facing out. Cook slowly on medium-low heat until golden brown and toasty. Most of your cheese should be melted when it’s time to flip. Carefully flip your sandwich and continue grilling. The second-side grills a bit faster, so turn the heat down to low and keep a close eye on it. When perfect, remove from the pan. Spread ranch sauce, to taste on one grilled cheese sandwich. 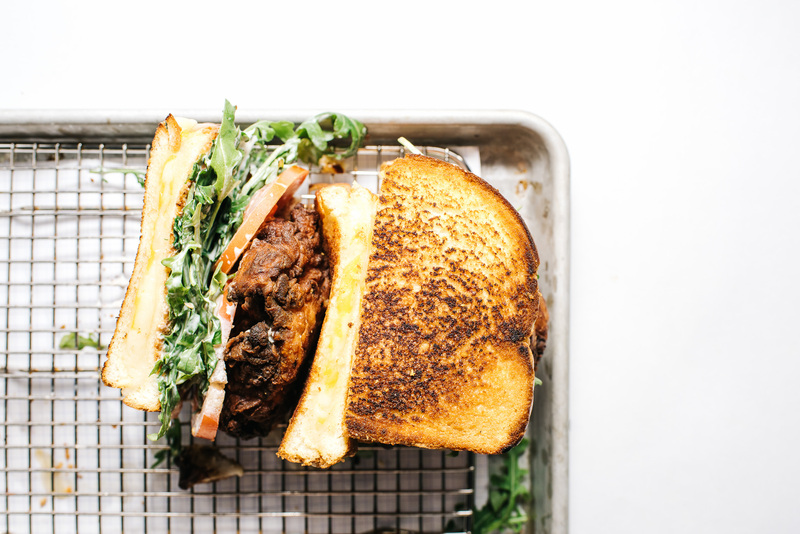 Top with arugula, sliced tomatoes, the fried chicken and the other grilled cheese. Slice in half and enjoy hot! This post was sponsored by Arnold Bread. Check out their Top #breadie contest on Instagram @ArnoldBread and vote for your fave creation. Thanks for supporting I am a Food Blog! fancy/unique enough that it completely satisfies the desire for something new, but still approachable enough that anyone would love it. (unless said person doesn’t like fried chicken, but i can’t imagine any meat-eater actually hating on fried chicken!!). Whoa this looks insane! I need this on a hangover day, sandwich goals over here! Everything about this sandwich looks so right, yet so wrong! 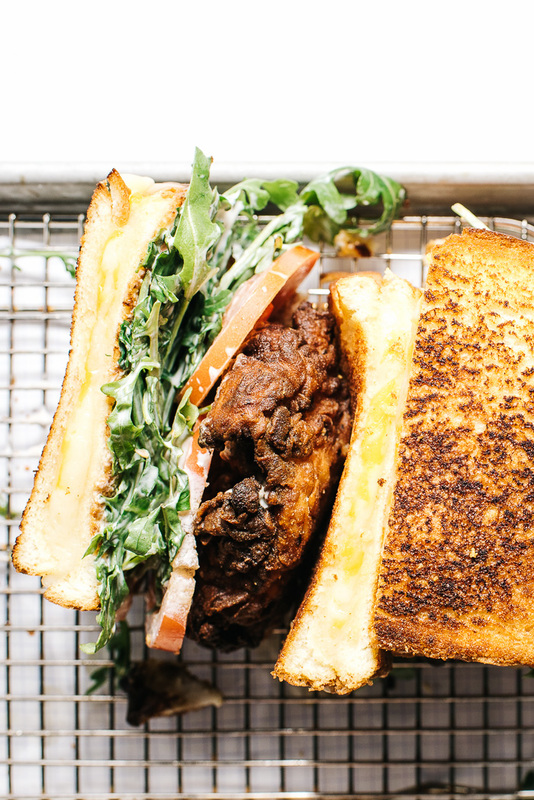 I never knew I wanted to combine tasty buttermilk fried chicken with oozy gooey grilled cheese, but now I must. I love frying in a cast iron skillet too. It requires less oil and cast iron really holds the heat well. Nicely done! 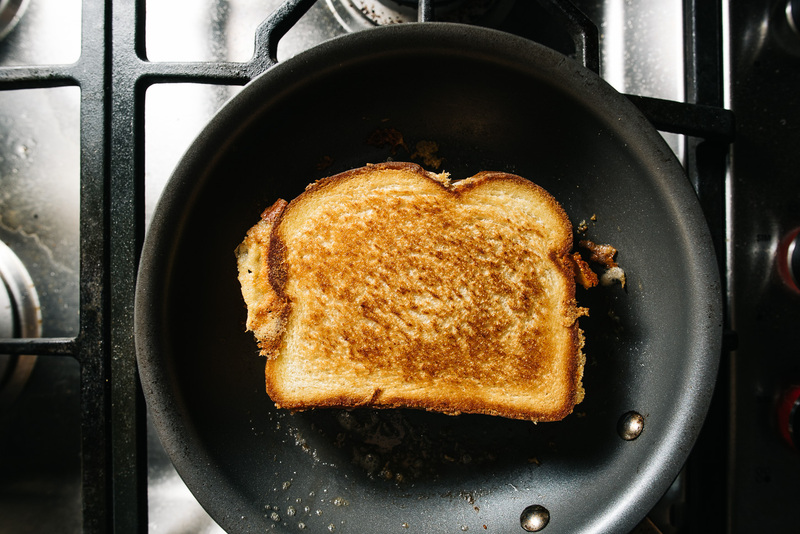 This is the perfect way to spend National Grilled Cheese Day! I’m always looking for new ways to change up old menu items. My fam is going to love this! Thanks! Well this just looks amazing. Yum. YUM! Decadent and delicious. I’d made grilled cheese with chicken before, but never the fried chicken. I think that’s going on an upcoming dinner menu. Thanks! Where was this when I was growing up. 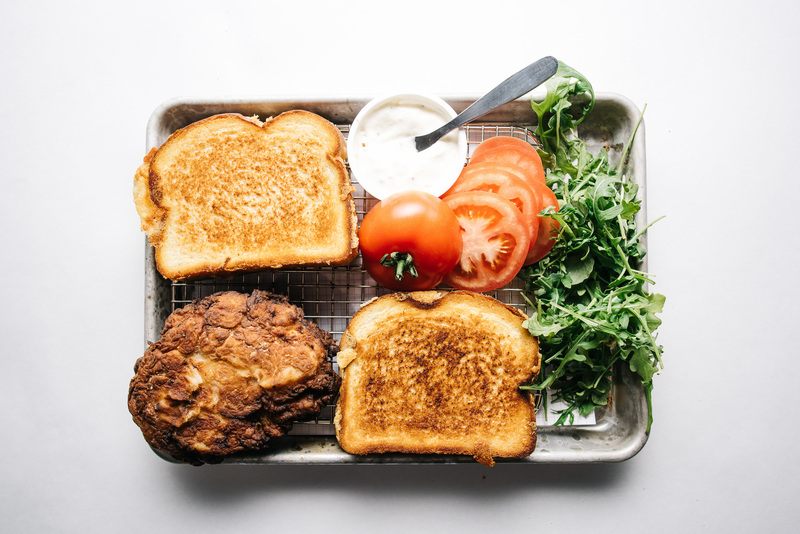 Fried chicken and a grilled cheese were without a doubt two of my favorite dishes as a child.